This lab, intended for AP Biology students investigates photosynthesis. Students use a hole punch to cut small discs from spinach. A syringe is used to remove the air from the spaces between the cells and the discs are then placed in a solution of sodium bicarbonate (baking soda) and exposed to a bright light. As photosynthesis takes place, oxygen is released and is trapped under the leaf and causes it to float. The speed and number of floating disk becomes a measure of the rate of photosynthesis. 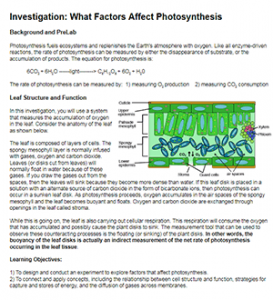 Once students are familiar with this technique, they design an experiment to measure how other factors can affect photosynthesis. Depending on your lab stock, instructors can make available a variety of variables to test, such as: light intensity, color of light, temperature, size of disks. The lab contains introductory information and prelab questions, and has a link to a video that demonstrates the lab technique. Students complete a CER (claim, evidence, reasoning) for observations made showing the relationship between sodium bicarbonate and rate of photosynthesis. Lab report guidelines are included if you wanted to assign a lab report, but it is not necessary for the activity. Hello, I just wanted to say that I am impressed. Great website 🙂 Thank you !